The key features of a standard machine needle are listed below. Their configuration varies from needle type to type. Top of needle that inserts into machine; most often has round front and flat back, which seats needle in right position. Body of needle below shank. 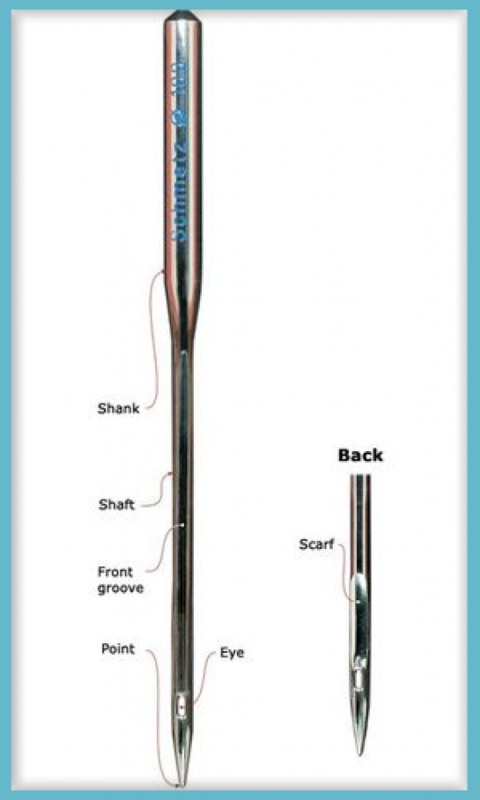 Shaft thickness determines needle size. Slit above needle eye, should be large enough to "cradle" thread for smooth stitches. Needle tip that penetrates fabric to pass thread to bobbin-hook and form stitch. Shape of point varies among needle types. Indentation at back of needle. A long scarf helps eliminate skipped stitches by allowing bobbin hook to loop thread more easily. A shorter scarf requires a more perfectly timed machine. Hole in end of needle through which thread passes. Needle size and type determine size and shape of eye. Sewing-machine manufacturers want their machines to consistently produce a perfect stitch. So the needle's configuration is engineered to manage thread and fabric to reduce the likelihood of skipped or flawed stitches. Each needle type produces a stitch by using a uniquely designed groove, scarf, eye, and/or point to enable the needle and bobbin hook to meet perfectly.